In the fourth chapter of the Gospel of John, an encounter takes place between a Jewish Rabbi and a Samaritan woman by the Well of Jacob. This event is often referred to as the story of “The Woman at the Well.” Whereas the woman is a unique character within this story, I believe that the focus here should be upon the man. After all, he arrived at the well first and he remained there after she left! In the opening verses of the chapter, we learn that it was necessary for the Jewish Rabbi (Jesus) and his disciples to go through the land of Samaria on their way to the region of Galilee. This was highly unusual for religious Jews of that time. The Jews typically avoided the Samaritans as unclean and would often extend the length of their journey by circumventing their land. The NYC equivalent, of the detour they would take, would be that of someone from Brooklyn going across Staten Island, into New Jersey, and back across the George Washington Bridge, to get to the Bronx in order to avoid passing through Queens or Manhattan. The Jews and the Samaritans really didn’t get along! The choice to travel through that land indicated that there must be some urgency in his mission. Yet we see from later on in the same chapter, that his necessity was not that of speed but of accomplishing his Father’s will. If it were for speed, he never would have stopped and stayed for two days! ... his necessity was not that of speed but of accomplishing his Father's will. At about lunchtime, being tired in his journey, (yes, Jesus became physically tired too) Jesus sat down near Jacob’s well in the town of Sychar. Sending his disciples to purchase some lunch, Jesus waited for the woman to keep an appointment she didn’t know she had. Presently she appeared. Carrying her water pot, her intention to draw water for herself was clear. Jesus surprised her with the simple request for some water. Usually, no self-respecting Jew would request such a thing from a Samaritan, and certainly not from a Samaritan woman. In answer to her shock, Jesus became more shocking. He told her that if she understood the gift of God, and who she was speaking to, she could ask for water from him and He would give her living water. In the understanding of those days, living water was the purest of water. Unlike water caught in a rain cistern, or drawn from the ground in buckets, living water was running water. It was typically from a mountain river or a natural spring. Incredulous, the woman sought for an explanation how He could do that, when he lacked a bucket and there was no such water readily available? Jesus explained that the water which He could give was different than all other water she had known. His water would satisfy her thirst continually and result in everlasting life. Liking the sound of that, she requested some. His water would satisfy her thirst continually and result in everlasting life. Now the woman could get living water! She understood that the gift of God was not water but eternal life and the forgiveness of her sin, and she understood who was speaking to her. All she needed to do was ask for it! At that moment the disciples returned from their shopping trip. Leaving the water pot, and without saying a word, the woman ran back to her village to tell the people that she had found the Messiah who is the Savior of the world. The disciples, surprised to find their master talking to this woman and not sure of what had happened, offered Jesus some of the food they had brought back. In response to them, Jesus answered that doing the will of his Father was more fulfilling to him than anything they could offer. ... doing the will of his Father was more fulfilling to him than anything they could offer. 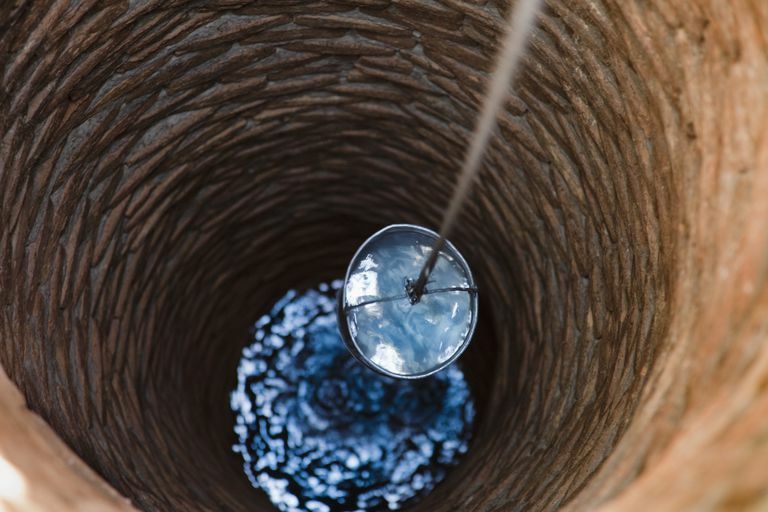 As a result of this meeting at the well, many of the Samaritans placed their faith in Jesus as their Savior, and found their spiritual thirst forever satisfied. What about you? Are you thirsty? Are you looking for something in life which you can’t find? You need a relationship with God! Are you hungry? Perhaps you already have that relationship, but still feel you are missing something! Are you doing the will of the Father? Perhaps you need a little encouragement. Part of the will of the Father is that you be studying the Bible and learning about him with other believers. We would love to have you join us for a small group Bible study. Find out what you have been missing!